At Survivalist 101, we are always on the lookout for unique and practical handmade gear that can be made from simple items or recycled materials. One of our readers, Steve Lupton, shared this DIY prepping project for making a coffee pot using soup cans and wire. Whether you want to have this on hand for bugging in or stashed in your bug-out-bag, it’s a quick and cheap diy prepping project. Clean cans ready for drilling. 1) Take a clean 12 oz soup can and drill 2 holes about a 1/4′ from the top (1 hole on opposite sides). Drill holes in soup can. Insert welding rod or wire pieces through holes in soup can. 3) Next, take a Vienna sausage can ( or comparable sized can) and drill 2 holes about a 1/4′ from the top (1 hole on opposite sides) Using a small bit, drill holes in the bottom in a spiral or circular pattern. (This holds the coffee). Drill small holes in a circular pattern in the Vienna sausage can. 4) Set the small can inside the larger one, align the holes, and thread the rod through them. Completed DIY coffee pot from soup can. 5) Fill the pot portion with water about 1/4 way up and get the water boiling over your fire. Set the sausage can with coffee in it and pour more water from your canteen or water bladder and let boil. Hot coffee! DIY coffee pot ready to use. 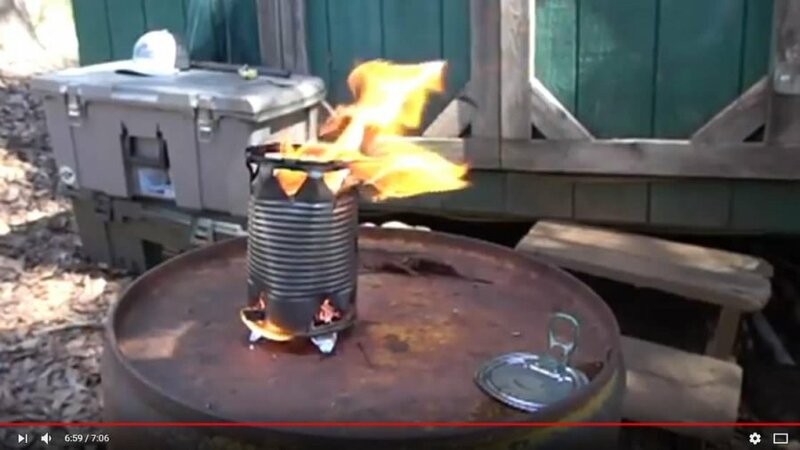 use our favorite soup can as a camp stove. Previous: Raising Fish for Food: Backyard Fish Farming for Survival.